Thanks to the recent development of top-of-the-range tourist experiences and the ever-growing selection of luxury hotels in Kaikoura, the area is becoming increasingly popular, especially with nature-lovers and adventure-seekers. When it comes to finding the perfect base from which to explore the town, you can choose from a variety of accommodation options, from tranquil lodges with panoramic views over the bay to treetop hideaways for a high-end stay with a difference. Even the small town centre and waterfront plays host to a variety of boutique hotels. Whatever you’re looking for, you’re bound to find something to suit your needs and preferences. Thanks to the upwelling currents from the maritime Hikurangi Trench, Kaikoura is home to a rich range of sea life. Take a whale-watching tour by sea or by air. Go swimming with dolphins, watch the seals playing in the clear waters and check out some of the seabird colonies along the Kaikoura Peninsula Walkway. On the other hand, you can take a luxurious boat tour and enjoy an afternoon of deep sea fishing. Don’t miss the opportunity to explore the Southern Alps by following some of the scenic hiking trails. If you’re feeling particularly energetic, head up to Mount Fyffe, where you may be able to catch sight of New Zealand’s North Island. Back in town, take the time to have a look around the Kaikoura Museum, which is home to fossilised dinosaurs and an earthquake exhibition telling the story of how this town has adapted to its unique geology. You can also take a Maori tour to learn more about the history and culture of Kaikoura. Alternatively, visit Fyffe House - a former whalers' station - which, at over 175 years old is Kaikoura’s oldest dwelling. Built on whalebone foundations, it gives an intriguing insight into the lives of these colonial settlers. 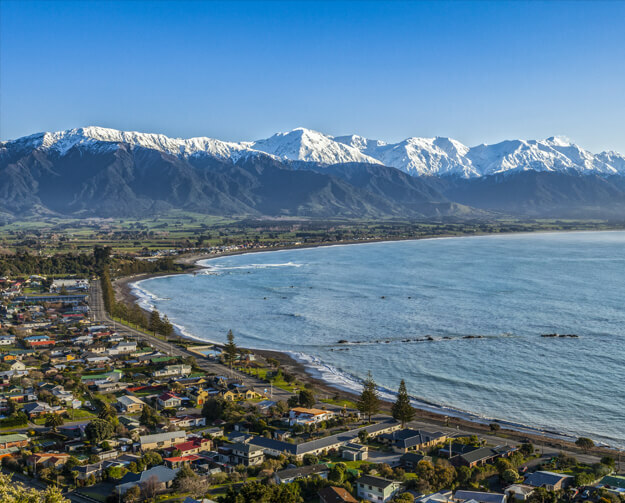 It’s no accident that the name ‘Kaikoura’ means ‘a feast of crayfish’. Pacific Rim cuisine specialises in seafood, and here you can gorge on succulent crustaceans, traditional fish and chips and locally-caught game. Enjoy it with some locally-brewed craft beer or world famous New Zealand wine from the nearby Marlborough region. Luxury holidays in Kaikoura can be peaceful, exciting, beautiful - or whatever you want them to be. Whether you’re travelling alone, as a couple or with family, our bespoke collection of first-class accommodation will ensure you have the best experience possible. Why not get in touch with one of our New Zealand experts by phone or live chat to discover more? We can help you create a tailor-made itinerary and answer any queries you may have about our holiday packages.